The Select Group comprises four sister companies: Select Roofing, Select Access, Select Flooring, and Lightning Protection Ireland. Together, they serve the construction and building maintenance sectors in Ireland and the UK. Major clients include Microsoft, Dell, the Aviva Stadium, and many more. We had already built individual sites for the four companies, starting with the original Select Roofing and then adding others as the group evolved. Management decided they would also like a single site for the group as a whole. We got to work on it. We spoke to the client about their vision for this site, and drew up a plan to match. Content was relatively straightforward, as all detail was already included on the individual sites. Rather than duplicating things, we decided to link from the main site to each of the others. This would lead the user to the Select Roofing site if looking for roofing solutions, Select Flooring for flooring, etc. The main task was instead to select the most appropriate projects and highlights from each of those other sites. This was to give the best overall view possible on the group site of their services and expertise. Again, we did this in consultation with the clients, so that our work matched their vision. 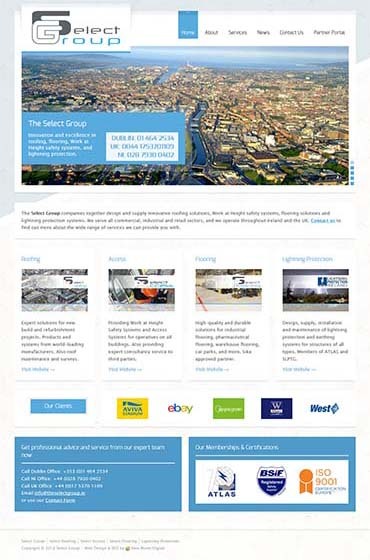 We built The Select Group website in the same style and manner as the individual sites. This was to ensure consistent branding and to emphasise the links between them all. We gave the back end of the site all our usual SEO attention as the build progressed too. This included writing metadescriptions according to new Google parameters, and optimising images too.